Palm Sunday – the Sunday of the Passion of the Lord, which this year was celebrated on April 14th, is a special day of preparation for the Easter Triduum. During all the Masses at our Shrine, the Passion of the Lord was read. The blessing of palms took place during all the Masses, commemorating in this way the solemn entrance of Jesus to Jerusalem. The two main Masses at the Shrine took place at 11:00 am and at 12:30 pm. During the procession at 12:30, Our Lady of Czestochowa Polish Supplementary School, presented beautifully decorated palms, the largest palms were about 3 feet long. 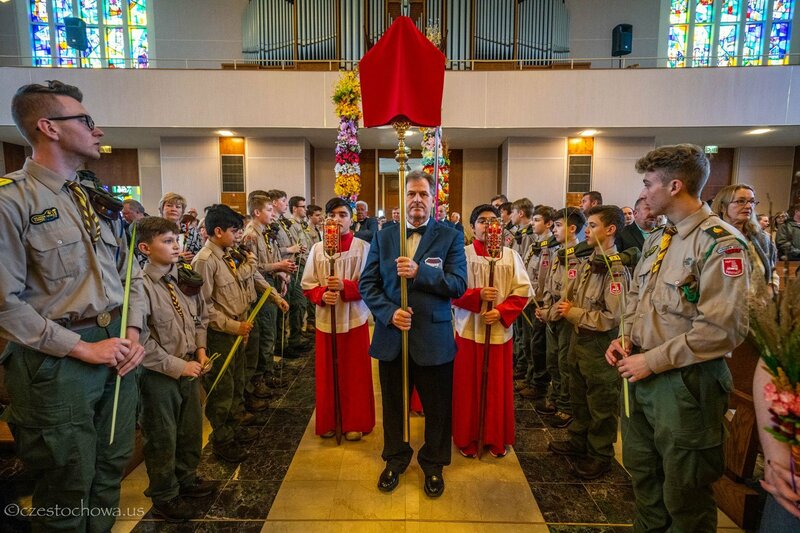 Polish Scouts from Clark, NJ also came to American Czestochowa for this beautiful celebration. On this day, the Polish School has also organized Easter Bazaar in the cafeteria. During the bazaar.